Contact Lenses That Change in the Light–Now Available at Illinois Eye Center! 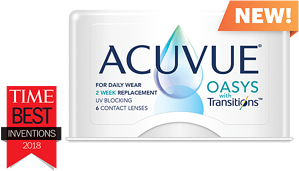 ACUVUE® OASYS with Transitions™ Light Intelligent Technology™ is the first-of-its-kind contact lens that adapts to balance the amount of indoor and outdoor light entering the eye. The lens activates in both indoor and UV light. So even when the lens looks clear, it's always working and adapting to different lighting conditions. While these lenses do provide UV protection to the areas they cover, they're not intended to be used as a replacement for sunglasses. Wear them with non-prescription sunglasses to protect the entire eye! Call us today at 309-243-2400 to schedule your next eye appointment, and find out if these light-changing contact lenses are right for you!